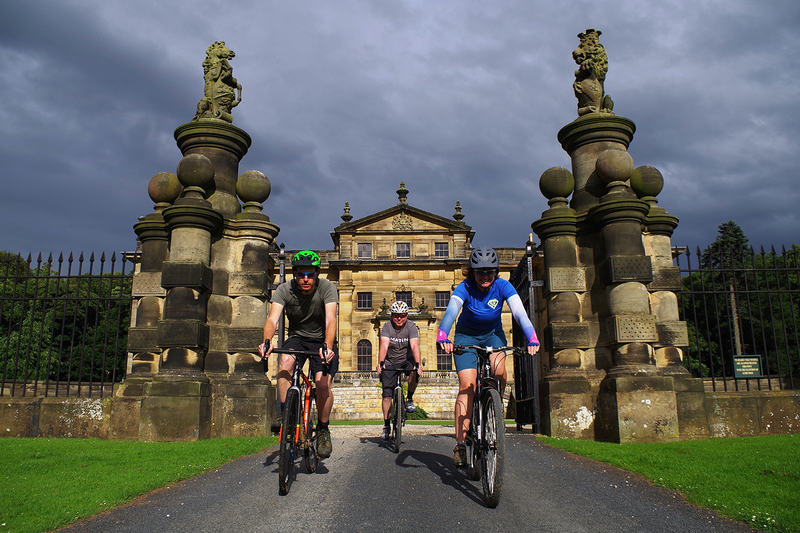 Some things worth noting about Duncombe Park Event HQ. Firstly – if you are paying on the day (or on the Saturday) at registration we can only deal with CASH. Yes, that’s a bit old fashioned but we like to keep it simple. There is a cash point in Helmsley so there’s no excuses really. If you are camping then please respect that folk will want to sleep before they go out for their ride. You might be happy riding on 2 hours sleep, but others won’t be. No noise after 11pm. The field that we are using is used for livestock. It might be mown, but no guarantee. It’s also on a little slope – if you are in a caravan, motorhome then you will need some chocks. If you are in a tent then you might want to think about how you position it to avoid waking up thinking you are heading down a bobsled track…! As it is a livestock field (they won’t be in the field that night!) please do not use glass, no open fires, and please, please tidy up after yourself. We are providing toilets so please use them. We are hoping to use this venue and repeat the event in the future. Whilst we’re on, do not litter the trail. The only thing you should leave is tyre tracks. Anyone caught littering the beautiful moorland will be eliminated. End of. No discussion, no excuse. We are limited on the signage that we can place to the Event HQ field. Follow the brown signs for Duncombe Park and keep driving up the long road until you get to the field at the top. That’s us. We are sorting out a BBQ for the Saturday evening, and of course Kirk’s will be there with their coffee van and light snacks until about 7:30pm. They are back on Sunday morning for that early morning coffee kick before you set out. Some of you crazy folk have been in touch about entry on the day because you don’t know what your legs’ll be like as you’re riding Kielder 101 on September 3rd. We reckon that if you are nuts enough to do the double, then we’ll back you! Entry on the day price will be £50 (EOD applies to any entries at registration on Saturday 3rd or Sunday 4th September). But bring your Kielder 101 race plate with you and we’ll give you EOD at £35 – same as the price if you had entered in advance. Can’t say fairer than that. So, if you boss Kielder 101 and you feel that you can take another ride on Sunday then respect to you. We’ll give you entry on any of the three distances at that price! Whether you are wanting a recovery ride and fancy the Stampede or want to give yourself a real challenge by doing the Outlaw. Entry on the Day – at registration on Saturday 3rd between 5pm and 9pm. Or, from 6:30am on Sunday until 7:00am for the Outlaw, and until 8am for the Stampede and Drive. We can only take CASH, there is a cashpoint in Helmsley itself. NO CHEQUES and NO CARDS. We’ve had a couple of phone calls and a few people popping into the shop to ask about a family ticket….so we’ve created one for you! Only available on the Stampede, if you book two adults on then two kids (aged over 12 and under 16) can go free of charge. You must ride with the children at all times and take responsibility for them – just as you if you were out on your bikes anyway. Registration for Yorkshire True Grit will open at 5pm on Saturday 3rd September until 9pm. You can pay for your camping at registration £5/night/person. Please bring your passport or driving licence with you to registration, and your kit. We may undertake a kit inspection (see kit list) or this may be randomly done on the route. On Sunday morning registration will open at 6:30am until 8am. If you are doing The Drive or The Stampede please give those doing The Outlaw priority in the queue as they start before you. Outlaw riders must register by 7am. Yorkshire True Grit’s, Outlaw pre-event briefing will take place at 7:20am at the start line. The event will start at 7.30am. The Drive and Stampede pre-event briefing will take place at 8.20am at the start line. These two events will start together at 8:30am. We will have one water point on the The Drive and The Outlaw and this is at about 20 and 28 miles respectively. Those on The Outlaw will pass this again at around 34 miles. There will also be one marshalled cut-off point as you leave Bransdale Estate to enter the Duncombe Parkland and this will be around 3pm – this will be confirmed and identified to you on the map. Everyone should be back at Yorkshire True Grit Event HQ for 5pm.